Hills. I love and hate hills in equal measure. Love rolling down ’em, hate riding up ’em, some might say. Not me. There’s a distinct pleasure in the pain of heading to the heavens. Not that many cyclists share my passion for hills. Beginner cyclists in particular tend to hate hills, as I once did. A love affair with hills takes time to mature. Like kids enjoying the taste of cabbage or adults the taste of olives. Hills, you might say, are like a certain branded yeast paste. You either love them or hate them. This one’s obvious right? Climbing hills on a bike is damn hard. Humans by nature are lazy, at least this one. We’re smart enough not to toil unnecessarily. Why go up when I can go around? The beginner cyclist in particular is at risk of death by a thousand pedal turns when they hit an incline. Overweight? You will suffer. Got the wrong position on the bike? You will suffer. Wearing unsuitable clothing? You’ll suffer too. Chosen the wrong gear? Yup, more suffering. Started too quickly? Oh dear, guess what, more suffering. 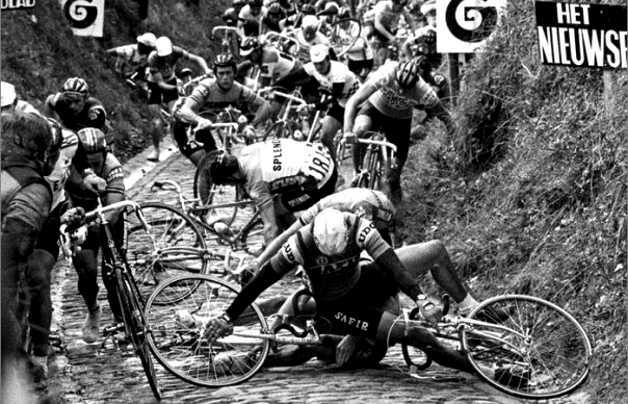 Even the most experienced of cyclist who has learnt the art of hill climbing can, and will, suffer. There are few worse cycling experiences than attacking a hill too early and looking up at the remainder of the climb, legs and lungs empty, head full of quitting talk. If climbing a nasty hill once is hell, then what do you call hill repetitions? Crazy is one word. I’m one of the strange creatures who climbs a hill only for the sake of rolling back down it and climbing it again. Not because I enjoy pain but because I’m in search of speed. Odd, right? Crawling slowly up a hill to increase my speed? With so little time in life for the joy of cycling, short sharp hill intervals are an excellent way to maintain and improve fitness. On the down side, hill repeats leave you feeling dizzy, sick and near death. If you don’t feel sick then you’re not trying hard enough. Three puke pushing hill repetitions are better than ten comfortable climbs. You’re there to hate yourself, to empty the tank, not to enjoy the view. If anybody tells you they enjoy hill reps they are lying. Sure, I enjoy the satisfaction of completing hill reps but only after, and never during, the ride. If this all sounds like masculine posturing, trust me, I don’t look especially tough at the end of a hill repetition session. It is inconceivable to some how hill climbing can be enjoyable. Forgetting the extremes of hill repetitions, a single climb elevates you, both literally and mentally. Plus there’s often a great view awaiting at the top. Many of the best hills are in countryside perfect for great cycle rides, be it the Surrey Hills, Devon, Wales, the Moors, Dales, Peak District, Lake District or Scotland. The climb itself is a battle of wills, fighting your every weakness in the legs, lungs and mind. Sometimes it can seem as if your body is against you, but it matters not, you’ll be dragging it to the summit despite its many calls to quit. I have few cycling goals except to ride more, and usually, faster whenever I can. Hills certainly draw out my inner chimp. Long before Strava my personal bests were tattooed onto my brain. I openly admit to shrieking like a teenage girl at a One Direction concert the last time I beat a specific time climbing my local hill. The buzz lasted a week. I am King Kong climbing the Empire State. Hear my wheeze roar. First of all forget about the bike. Forget about the hill. These are inconsequential in the grand scheme of things. Improving your hill climbing technique is at best five percent bike and five percent hill. The remainder is all about you. Your physical and mental state will dictate how you climb. Oh and the wind, but there’s not much you can do about that but choose your Strava segment hunting days wisely. The advice below is for those who want to climb hills quickly. I’m not going to pretend hill climbing should be some mythical science. It is not. Ride any hill slow enough in a gear low enough and you’ll reach the top. Don’t look up. Hill climbs make us suffer with reverse vertigo. We get dizzy if we look up at the incline stretching out ahead, the never ending, brutal gradients with more hairpins than your local beauty salon. Knowing thy enemy will help, but don’t get making a mountain out of a mole hill. If the hill has you beaten before you climb on a bike then you’re in trouble. Besides, nervousness is energy wasted, energy that could be spent turning the cranks. Break the hill down. It’s ten 100 metre segments, not a kilometre of madness. Plan your effort accordingly, rest at the outside edges of hairpins where the gradient slackens. Focus on the next pedal stroke. Count the revolutions, verbalize the pull and push of every half crank turn, dream of the bacon sandwich awaiting your return, anything to distract you from the wall of tarmac ahead. You don’t need a physicist to tell you things of lower mass are easier to lift. What? Cut the pork scratchings out young man. Oi, stop licking the bacon grease from the frying pan. Sucking your belly in may work at the cake stop but offers little aerodynamic advantage when hill climbing. There’s a reason why the hill climbing season is so short, a) it’s hard work climbing and b) even harder keeping the weight down. Not that I’m advocating crash diets or a desire to look as frail as Froome. Just lose the puppy fat, cut a few treats out and boom, off you go. Cheaper than new wheels. Don’t get attacking hills too hard if you’re unfit. 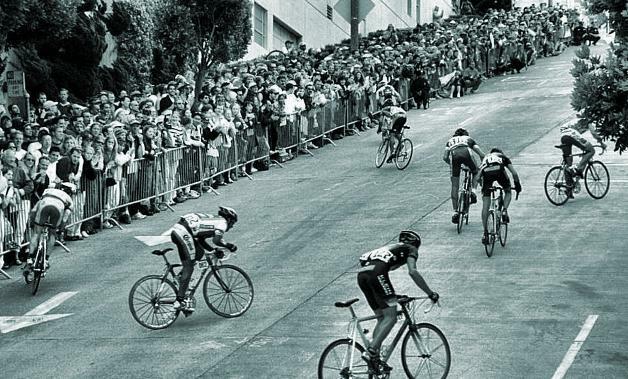 The traditional UK hill climb season begins in September for a good reason. A glorious summer’s riding has given us the strength and stamina to ensure we don’t injure ourselves when we inevitably overcook it on a hill or two. Make sure you have a good base fitness if tackling hills relentlessly, otherwise you risk injury. 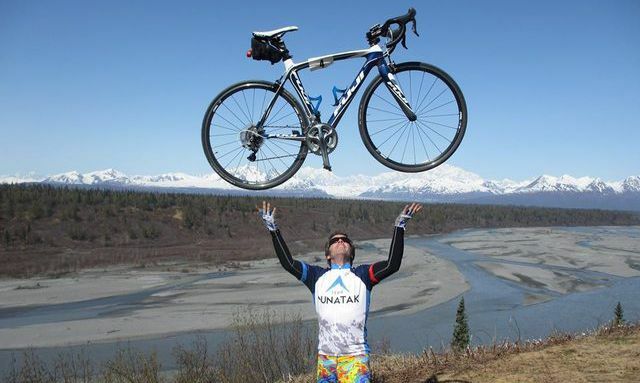 Cyclists are not renowned for their upper body strength. Opening pickle jars is a challenge let alone ten press ups. Yet the aspiring grimpeur (French person who climbs mountains) must condition their upper body to help pull on their bars when the gradient hits crazy percentages. I’m not advocating barbells and silly gymnasium machines here, simply do a few press ups at home every now and then. Don’t neglect your core strength either. Firstly you’ll need a strong middle to avoid injury when you put your body through the heightened stress of an all out hill climb. Core strength will improve your balance, your pedalling technique and stamina, especially when you get out of the saddle. Again, I’m not suggesting you take up yoga or Pilates. A few sit ups or planks at home will be enough. 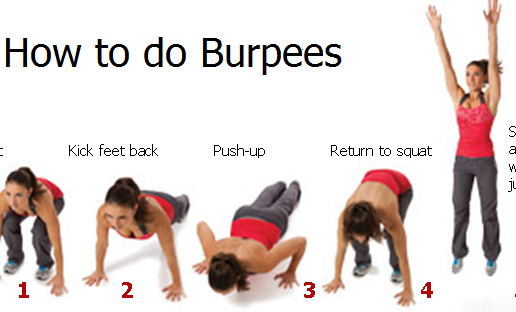 Or maybe the dreaded burpees if you’re mad enough. Treat each and every hill like a new lover. Study their faces and learn their curves, their mood swings, and er, how they like to be ridden. Short and sharp? Power up. False flats? Don’t get overexcited. Long and steady? Stay seated, find a rhythm. With Strava and countless other sites providing climb profiles and even the times of people riding them, it doesn’t take too much effort to cosy up to your chosen one before you climb on your bike. When riding a hill for the first time you have a few options. One, ride up slowly and take note. This is not for me. I simply cannot ride slowly up hills, unless of courses I’m exhausted! Two, approach the hill so that you need to descend before you can climb. This helps a little but it can be hard to judge a hill when descending, with curves, gradients and lengths easily over or underestimated. Finally, there’s the third approach for the kamikaze in you. Hit the hill as hard as you dare and see how long you survive. If you make it, then well done for this is a rare feat. More likely you will run out of juice and crawl to the top begging for forgiveness. Still, you’ll have learnt a very valuable lesson. 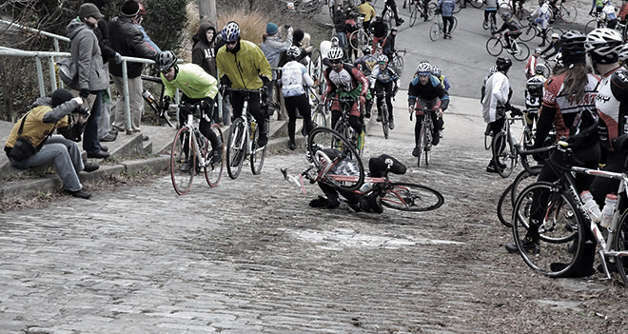 Never go to into the red on a climb until the last few metres. Finding the correct pace for a hill can take time. Mix up your approaches to see if you’re a consistent steady sort or a slow starter with a powerful kick. Your tactics will undoubtedly vary depending on the hill, from the short sharp lung busters to the long and steady thigh tremblers. Lastly, and least importantly, think about your bike. What do I mean the bike isn’t important? Well most hill climbers sure do like to obsess about the weight of their bikes. All well and good once you’ve mastered the basic hill climbing advice above, which is where the biggest time gains in hill climbing will come. So what about the bike? Sure drill holes in your components and follow other weight saving advice should you so wish. For most of us little tricks like reducing the amount of water we carry are enough. Such things will matter little if you choose the wrong gear when climbing the hill. Aim to maintain a high cadence. I’m not saying you should spin away like Froome or Armstrong. Circa 90 rpm should do the trick. If your cadence begins dipping below 60 it’s a sure sign you need bigger cogs on the back, or bigger thighs. What else? Stay seated. Don’t waste precious energy supporting your own body weight. Some say standing up is a sign you’re overgeared or underpowered. Technically true but every rider is different. Besides, there’s a lot to be said for standing up to stretch tired legs. Plus you’ll also be using different muscles when standing, resting those that are screaming for help. Ha, and so we come full circle. Hill climbing is inevitably hard work. Anyone can climb any hill, but to climb that hill quickly will take practice and effort and research and a certain detachment from reality for however long the pain lasts. Last one to the top buys the beer. What about you, what hill climbing tips do you have? Ha! It’s a tough one to explain for sure. Most people think I’m mad, even cycling friends. Was out yesterday and climbed a hill so hard my lungs were burning afterwards. It took me a good thirty minutes to fully recover, during which time I hated cycling! Yet once recovered, the smile returned and I was enjoying what joggers would call a runners high. Only without the knee pain! Love climbing hills, though I can’t say I’m that fast. We have many steep sections round here (15%+) so a big (34 tooth in my case) rear sprocket eases the way nicely & helps me maintain a higher cadence. I sometimes stand just because I like it as well. “The cyclist’s body – a cling film wrapped chicken carcass” – this will have me laughing for a week I suspect. Enormously entertaining and useful as ever. Thank you. If I come to anything that has a gradient my mantra is ‘never look up, never look up, never look up!’ It makes a huge difference, as does the belief that you can do it. Belief is key. I love riding with new cyclists and helping them overcome a steep hill. They rarely believe they can make it to the top but when they do, you can see the pride and belief it instills in them. Only downside? They never stop talking about it! Don’t much like climbing steep hills (too old, too crocked, too heavy) but there is something hypnotic about gentle hills with a steady gradient. Hypnotic, that’s a lovely way of thinking about long hills. You certainly need to enter a trance to maintain your tempo and avoid the temptation to turn around. Inner voice? I often shout out loud, in between gasps of course! Interesting, I used to do my own very limited hill reps on a short sharp hill in my area, but talking to Tejvan Pettinger on his blog, he advocates doing longer, but just as steep hills, recover by riding to the next one and that maybe 5-10 mins away and go up it. Try to find 6 different ones and in my area Cornwall, I can. I have now increased to 9 hills, all at an ave of 7% with 15+% sections and as you say, the feeling after is fantastic. Great blog by the way, always a good witty read. Thanks Chris. 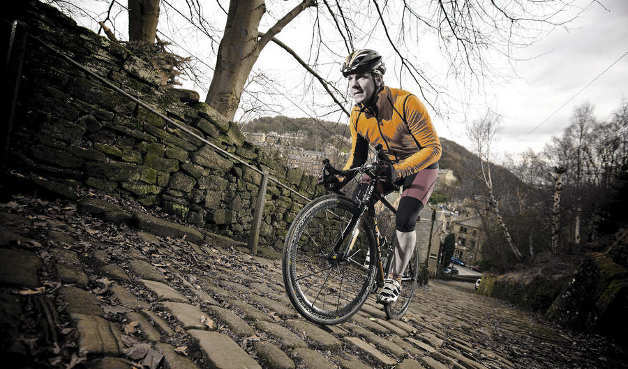 The advice of the National Hill Climb Champion is certainly advice worth taking! Enjoy Tejvan’s blogs too, he was the inspiration for my blog. I think it depends upon what you are training for, a PB up a short or long hill, but overall I like to mix it up with both short and sharp and then longer hills too, or threshold like time trial intervals. 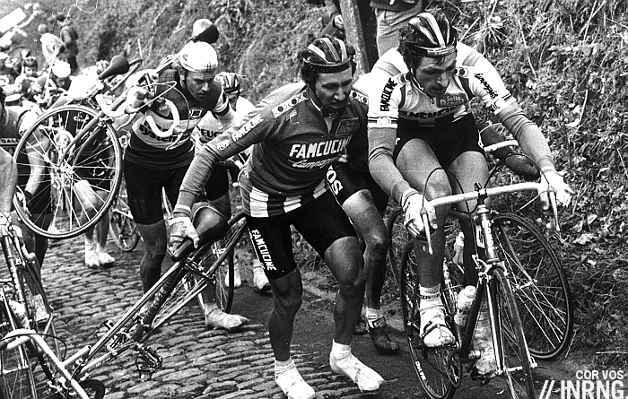 I can’t remember who it was but one former hill climb champion never actually did much hill climbing let alone repetitions, preferring instead intervals on the flat to increase his power. Tevjan’s advice is certainly solid. One of the most important things with hill reps is to make sure each and every one is near your threshold. Sometimes if you repeat too quickly without recovering then you will flounder up the hill which is good for nothing. I’m coming to learn that it is better to train at 95-98% three times a week rather than 110% once a week, which leaves you mentally and physically exhausted. Enjoy them hills, sounds like you have some great variety down there in Cornwall. Good post. I like to climb and also enjoy hill repeats. I am not fast but faster than I once was. Faster than I once was. Now that’s the best reason there is to cycle uphill, thanks PedalWORKS. Great post, HC! I’ve been really working on power to weight for a while. I am also tinkering with the idea of a compact or 11×28 cassette. What’s your take on those things? Thanks secondratecyclist. I could write about hill climbing for a lot longer than I can climb them! I’m toying with the idea of a 28 myself. Grinding up hills is a lot of fun but quickly wears you out. I was in Wales recently and would have paid good money for a 28! There’s a lot of needless machismo in cycling about mashing big gears, which is a little silly. Look at the pro’s, they’re quick to put bigger cogs on the back for the steep climbs because they know it is more efficient. Certain climbs demand easier gears. Super steep or long and very steep would call for bigger gears. Here you will be quicker with a bigger range of gears. I don’t mind mashing over a short steep section but cycling becomes a lot less enjoyable if you’re crunching your knees through 30 rpm for any serious length of time. Most of rarely use the majority of gears on our bikes, so think about it this way. How many times do you click the gear levers in search of a lower gear you don’t have compared to searching for an extra higher gear you don’t have? Good point! There was a picture in Velonews of Contador (in the Alps) with some monstrosity like a 14×35 or close to it. It looked like he had a mountain bike cassette on it! Thanks of the tips! Use a mountain bike cassette on mine (34 as I commented earlier). I’ve used it for years. Interesting to see that younger cyclists round here are going that way too, with a 32 or 34. Some pretty gnarly ascents though round here, but has been great on Bealach na Ba, Alpes d’Huez & Galibier so can’t be bad! Hoping to go to Mallorca in the spring, tempted by hire bikes, but big gears for my old knees! Thanks – looks like I’ll have to go. Got 2 road bikes. On one is a 7-speed Sunrace 13-25 with a 46/36/24 crank. The other has an 8-speed cassette 12-25 with a 44/32/22 in front. I find I don’t need to train that much with these gearing to climb uphills. You probably fly up cliff faces with such a range of gears! I remember my old triple, great for hills but have to say I barely used most of the gears. Cracking post this. Can’t argue with much of what you say – I think you’re on the right lines in saying a large percentage of the game is in the mind. Once you start to blow and wheeze half way up a climb your mind will create all kinds of mischief to try and get you to crack. I make a point of anticipating the mischief wherever possible! out of interest, why would a pro want to go higher than 28? I would have thought they’d have the physique to cope or is it because the hills are so bloody steep? Bloody steep! Plus efficiency on a hill saves your legs for later in the race when they’re really needed. And a 30% climb on fresh legs is very different after a gruelling day in the peloton. 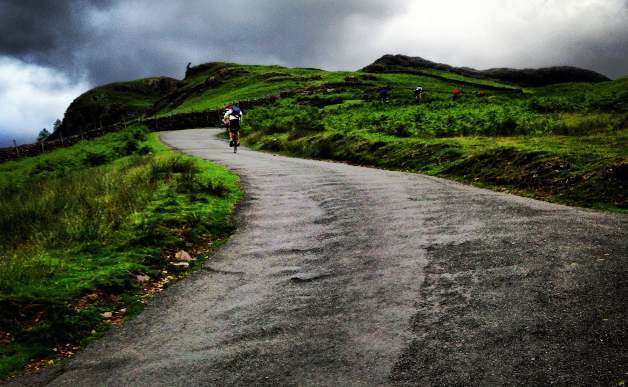 Great post, just kept nodding and smiling – it’s always a pleasure/pain thing with hills!